Our awesome friend and My Daily Bubble contributor Megan, from The Homes I Have Made, shared our Name Bubbles Letter Wall Decals in action. Her post was just so amazing we couldn’t wait to share with all of our very own readers. See Megan’s post below on renter-friendly ways to spruce up your home with our removable and repositionable Letter Wall Decals. I’m on a mission this year to discover, try, and share different ways to color, personalize and style walls without using paint! While a lot of my ideas will be DIYs, I’m also on the lookout for great ideas and products that have major impact without the time commitment and long project list. When my very good friends over at Name Bubbles asked me to help spread the word about their latest product line, I knew it was a perfect fit. Colorful, jumbo, removable monograms? Yes, please! As some of you long-time readers know, I’m a huge fan of the Name Bubbles company! I first fell in love with their dishwasher- and laundry-safe labels for Henry’s sippy cups and jackets and then their dishwasher-safe, dry erase labels we use on all of our pantry containers. I contribute projects to their blog, My Daily Bubble, and adore being part of the (extended!) Name Bubbles family! While I may be a bit biased, I have to tell you guys: these wall decals are so awesome. The colors are vibrant, they are huge and impactful, they are inexpensive, and are 100% removable and repositionable. If you’re looking for a simple way to add a major pop of color to almost any space in your home…this is it! It honestly took me longer to figure out which amazing pattern, font, and color combination I wanted on my decal than it did to hang it up on the wall. You have to pop over to the Name Bubbles Wall Decal page and play with the super fun interactive menu that allows you to customize your decal in so many fun ways and see it right on your screen! On a whim, I landed on the pink (what?) stripes (obviously! ), and the decal arrived rolled up in a protected box just a few days later. The decals are made of a nice, woven material, so they won’t rip when you manipulate them. I followed the simple instructions included right on the decal backing, and had it hung in a matter of minutes. I did have a few bubbles when I first applied it, but as advertised, I could completely remove the decal from the wall and re-lay it a bit better. I chose to place mine above a set of bookcases and styled it up with some girly accents. Such a fun and whimsical display! A ton of color and personality…all of which can come with me when I move! The monogram also comes with two mini monograms that look exactly the same but are about 4″ big. These are perfect for decorating pencil cups, vases, water bottles, lamp bases, picture frames… anything that could use a dose of preppy pattern! 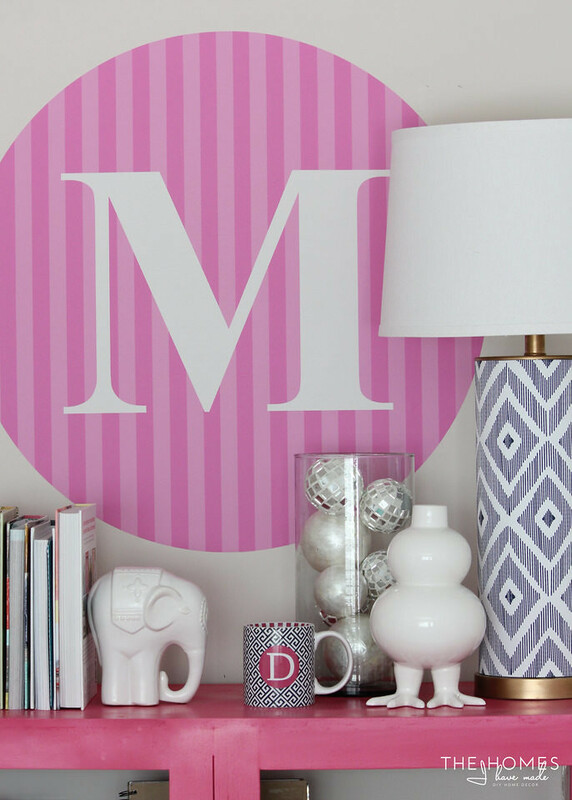 Monograms are a fun and graphic way to decorate your walls. The size of these decals combined with the fun color combinations and patterns make these a fun addition to almost any space. If you move around a lot and want to bring it with you, just be sure to hold on to the paper it comes on to ensure your decal travels safely! I hope you all had a fantastic weekend. I’ve been a busy bee lately between home projects and working really hard to get the new site up and running (hopefully soon!). Thank you so much to all of you who left thoughtful comments on Friday’s post. I love the warm response I get on the more personal posts, and I’m so glad you guys loved it as much as I enjoyed right it. Don’t know what I’m talking about? Catch up here! I did not receive compensation for this blog post; however Name Bubbles did provide the wall decal for me to use and review. Please remember that I only work with brands and products I fully support and that make sense for my home, my family, and this blog. All opinions are 100% my own!